ClubCoins Nødvendigt: 338 Please note that, for now, you cannot download content from our platform directly onto a mobile device (phone, iPod, iPad, tablets...). You need to download your items onto a PC or Mac, and then transfer them onto your device in the normal way. We are working on allowing direct downloads to mobile devices but this is not possible in the current version of the platform. Sorry about the inconvenience! NOTICE: Activation key must be used on a valid Steam account. Requires internet connection. About the game	Winner of more than 200 Game of the Year Awards, Skyrim Special Edition brings the epic fantasy to life in stunning detail. The Special Edition includes the critically acclaimed game and add-ons with all-new features like remastered art and effects, volumetric god rays, dynamic depth of fi… eld, screen-space reflections, and more. Skyrim Special Edition also brings the power of mods to the PC and Xbox One. System Requirements Windows - Minimum OS: Windows 7/8.1/10 (64-bit Version) Processor: Intel i5-750/AMD Phenom II X4-945. Memory: 8GB of ram. Hard Drive: 12 GB free HDD space Graphics: NVIDIA GTX 470 1GB /AMD HD 7870 2GB	Windows - Recommended OS: Windows 7/8.1/10 (64-bit Version) Processor: Intel i5-2400/AMD FX-8320. Memory: 8GB of ram. Hard Drive: 12 GB free HDD space Graphics: NVIDIA GTX 780 3GB /AMD R9 290 4GB © 2016 Bethesda Softworks LLC, a ZeniMax Media company. 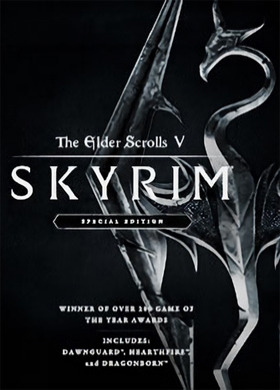 The Elder Scrolls, Skyrim, Bethesda, Bethesda Game Studios, Bethesda Softworks, ZeniMax and related logos are registered trademarks or trademarks of ZeniMax Media Inc. in the U.S. and/or other countries. All Rights Reserved.